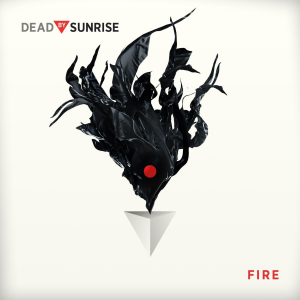 "Fire" is the first track on the album Out Of Ashes by Dead By Sunrise. It was first released on September 1, 2009 on the band's MySpace page and on September 9 as part of the soundtrack album for the Japanese film Tajomaru. Chester originally wrote the song to deal with his personal feeling about God, but it was changed lyrically to make it more about a relationship between two people rather than a relationship between him and his God. He said the song is about feeling alone and knowing that even at that moment you can look up or look outward and know you're not alone. "That song took a few different lyrical changes. It started out one way that was really like a sad story using interesting metaphors and that’s where the name ‘Fire’ came from. The lyric that inspired the title was, ‘There’s a fire in our hearts that’s the reason why the tears keep falling, to put out the fires that our hearts are starting.’ That’s where it came from, [but] the melodies didn’t quite seem to fit. So I started over, and kind of just ran with that, and went with a more spiritual path of getting through the tougher times. Some people may look at that song and just say, ‘Oh he must have wrote that about someone who passed on.’ Or, ‘Wow that’s really sad.’ Or some people may see it as a spiritual thing, looking up at the heavens, and you know that there is something greater than yourself that’s with you all the time. This is probably one of those songs that is written with a Linkin Park sort of a touch, because it’s more open in general. Songs like ‘Condemned’ and songs like ‘Inside of Me’ are pretty straightforward—there is no question as to what those songs are about. This one the fact that it can be seen in so many different ways is what makes it special, and I think that’s what going to give it the ability to connect with people in a much deeper way then perhaps other songs on the record. Oh, and by the way, ‘Give Me Your Name,’ I wrote that song for my wife for our wedding." Released on LPLive for free download on March 20, 2018. "Fire" was debuted during Linkin Park's 2009 summer tour at the show in Stuttgart as the first song in the first encore of Linkin Park's set. After the first show, it was moved to the second song, after "Crawl Back In". Once Dead By Sunrise started touring for the promotion of Out Of Ashes, "Fire" was a part of the short, eleven song set, being featured after "Morning After". During the KROQ Almost Acoustic Christmas performance, since "Morning After" was dropped, the song was played after "Condemned" for the first time, and once the band embarked on their Asian tour in 2010, "Fire" was used to open the shows. The song maintained this position for the remainder of the Asian and European tours. "Fire" is featured in the 2009 film Tajomaru and was included in its soundtrack album. This page was last edited on 17 July 2018, at 22:45.